The Jones clan is all smiles outside the courthouse on “adoption day.” The brothers (from left) are Canaan, Judah, Levi, Seth, Titus and Silas. When Cory (’01) and Christina (McCarty ’01) Jones prayed for God to disturb their cliché suburban lives, they weren’t expecting the answer to be three more sons. But that’s exactly what they got. 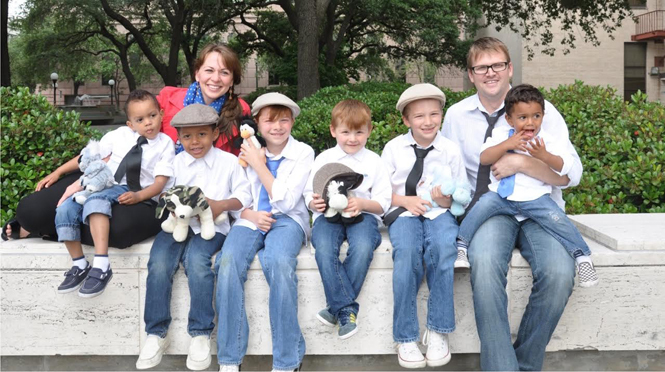 The couple has three biological boys (Levi, 11; Titus, 8; and Seth, 6) and adopted three more boys (Judah, 6; Canaan, 4; and Silas, 3) after fostering them. Christina is an occupational therapist in Little Rock, Ark., and Cory is pulput minister at CrossWalk Family of God. Read Christina’s account of their family’s “accidental adoption,” as we continue our series about Abilene Christian University alumni who have followed their hearts to rescue children around the world. First comes love. Then comes marriage. Then comes baby in a baby carriage. Indeed, that playground song was pretty accurate for my husband and me. Cory and I graduated from ACU in 2001, completely smitten with each other. We married the summer after graduating and then moved to Richmond, Va., where he had a job as a youth minister. About a year after we married, we were surprised to find out that we would be in the market for that aforementioned baby carriage sooner than we had planned. Nine months later our little red-headed surprise rocked our world, but his arrival didn’t hold a candle to the time we accidentally adopted three boys. 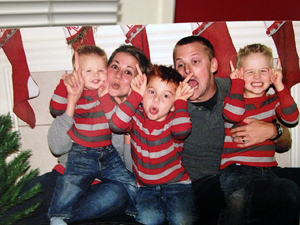 The Jones family in pre-adoption days. Fast-forward to 2010. We were living in Houston and very much enjoying the cheaper cost of living. Cory was a youth minister at West Houston Church of Christ, I was working part time as an occupational therapist, and together we were raising our three young boys Levi, Titus and Seth. We hadn’t intended to go the biblical route with our boys names. We actually fell in love with the name Levi, thanks to a contestant on the show “Fear Factor.” Then when baby No. 2 came along and continued the not-a-girl pattern we had already fallen hard for the name Titus. Thus, obviously by the time boy No. 3 arrived the ship was too big to turn, and Seth naturally became Seth. We were a small family of five living in a five-bedroom house and beginning to feel the weight of that gluttony. Cory was involved with several homeless ministries downtown, and it was especially sickening knowing that thousands of people were sleeping on the streets while we had extra rooms in our house that we didn’t ever step foot in. We explored a few ways to use our house to help others, but adoption was never on our radar. At one point, through some loose connections, we learned of a single man and his daughter who needed a place to stay and we connected with them, but it fell through at the last minute. All the while, the verse from Luke 12 that promises “to whom much is given, much is expected” was gaining steam in our minds. I knew of a family that had been involved in foster care, and I started asking them some practical questions about what it took and how the system worked. I can’t say that I ever felt a special calling to be a foster mom, but at the same time, as I learned more about what it entailed, it weirdly felt like a role I had been preparing for my whole life. And so in August of 2011, with our official foster license mounted by our front door, a CPS worker pulled into our driveway with two scared little dark-skinned boys. Ten days later she returned to our house toting their 3-day-old half-brother, still wearing his hospital tags. We now had six boys under the age of 8, and they filled our house with dirty diapers, insurmountable loads of laundry, Curious George, sibling rivalries, tear-filled nights and laughter – so much laughter. In June of 2012, the judge declared it was time that the boys return to their mom. After 11 months in our home the goodbye was gut-wrenching and hard, and all those other things that people sometimes use as excuses when they say they could never be foster parents. The six Jones boys today. But it was also beautiful. Ours was a unique relationship with the birth mom. We had grown to love her and with grace could see her as a wounded soul and not as a list of criminal charges. We were rooting for her. We never became foster parents to adopt, and had actually moved to a new state during the six weeks she had them back, yet we found ourselves fighting the system to add her three boys to our family. We changed their names to Judah, Canaan and Silas, because we wanted to claim them as ours and mark their new stories in faith. It has been three years now since we prayed those first prayers asking God to disturb our cliche suburban lives. I’m not the same woman I was back then; the number of boys who call me momma and the number of moments I have cried out to God have both dramatically increased in a weird pattern that can only mean they are related. Our adoption journey has beautifully dripped with God’s presence throughout, but it has also been painful because it was born out of tragedy. All adoptions are. I didn’t know the sacrifices it would take to fuse a blended family together. My husband and I strongly believe that adoption was never God’s original hope for any child. It is a redemptive “Plan B” for our sin-filled world. But it’s worth it; my boys are so worth it. And so are the thousands of others just like them who are in need of a permanent family. That’s why we are making plans to adopt again – this time on purpose – but both times on faith.